This book is a stunning facsimile of the one that was collected and assembled by Attenborough, it has been commissioned with his help and permission, as well as signed by the great man himself, it will continue to increase in value and be the jewel in your collection!! The Book was limited to 750 Signed Copies worldwide, so is very rare, and unless someone like me sells you will not see these books for sale anywhere!! A message from David Attenborough. 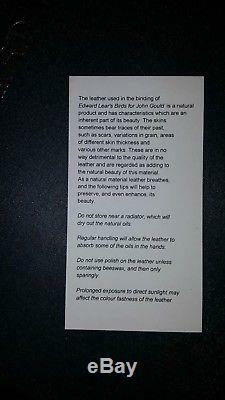 I first became aware of E. Dward Lears bird plates in 1954. We brought back hummingbirds, anacondas, caiman and marmosets, but I hankered after pictures of some of the spectacular birds which I had just seen for the first time in the wild. Many of these are depicted in the prints issued by the 19th-century naturalist and publisher John Gould. Among the first I found was one of a Toco Toucan. It was a particularly dramatic composition, and it was signed very emphatically E. It was then that I discovered that the poet whose nonsense verses I had loved as a child was also a superbly accomplished ornithological artist. From then on, I kept an eye out for more of the prints that he produced for Gould, and this became a decades-long endeavour to collect them all a total of 80 lithographed plates, to which was later added an original drawing. Lears bird plates, to my eyes at least, rank among the finest of their kind, and I was pleased to have collected them all into a single volume, separated from works by lesser talents. And to know that they will now be available to a broader audience, published together for the first time, is immensely rewarding. 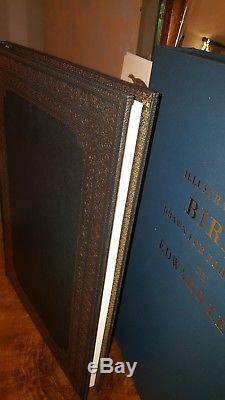 Whats more, the work undertaken by The Folio Society to reproduce not only the prints, but even an original 19th-century binding, has produced an edition worthy of this great artist. Bou nd in full leather, elaborately gold-blocked, it is a truly remarkable reproduction. There could hardly be a better celebration of Lears 200th anniversary. Limited to 780 numbered copies worldwide. Printed on matt-coated wove paper. 80 hand-coloured lithographs and one additional drawing in high-quality reproduction. 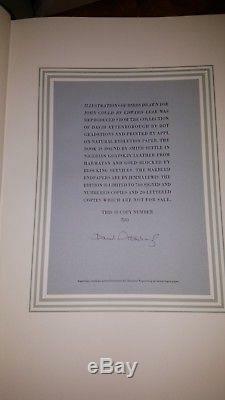 Limited edition certificate, printed letterpress, signed by David Attenborough. Bound in full goatskin leather with gold blocking on front, back, spine and inside edges. Shuffled pages, gilded top edge. Imperial folio format measures 21¼" x 14½". 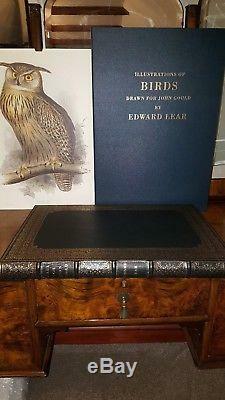 Presented in a buckram-bound solander box along with a beautiful print of the majestic Eagle Owl (unframed). Youtube has a video of the book when it was finally finished and presented to David Attenborough, I would look to go online and view this in order to get a better understanding of what is on offer here, a simple search of' Folio Society Attenborough' brings up the video. It is the 1st one. 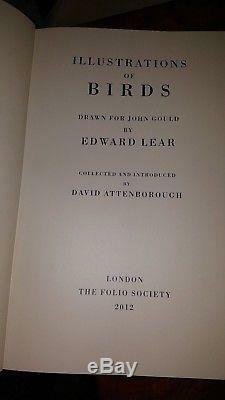 The item "Folio Society, David Attenborough, Birds Drawn For John Gould By Edward Lear" is in sale since Thursday, August 16, 2018. This item is in the category "Books, Comics & Magazines\Antiquarian & Collectable". The seller is "markanthonyjones1974" and is located in Dudley. This item can be shipped to United States, European Union member countries, Canada.